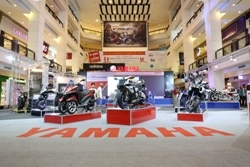 KUALA LUMPUR, 7 AUGUST 2015 – The Yamaha Motor Show 2015 will take place from 7 to 9 August at the Lower Ground Floor of Berjaya Times Square Kuala Lumpur during the mall’s opening hours from 10am to 10pm. 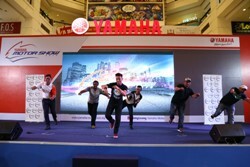 Organised by Hong Leong Yamaha Motor Sdn. Bhd. 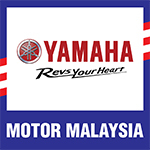 (HLYM), the Yamaha Motor Show 2015 promises an array of heritage, current and innovative exhibits with fun activities planned for all motorcycle enthusiasts and their families. 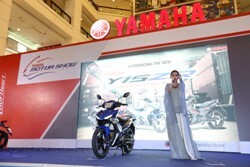 “The Yamaha Motor Show is held to generate additional brand awareness for Yamaha with the desire of instilling pride of ownership amongst Yamaha bike owners. 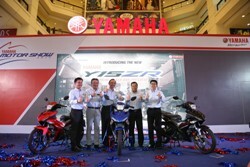 We also hope to create a positive image for motorcycle riding as a healthy lifestyle for the modern Malaysian family.” said Dato’ Jim Khor Mun Wei, Managing Director of Hong Leong Yamaha Motor. On display will be the latest range of Yamaha motorcycles from the top-range super sport Yamaha YZF-R1M, the adventure touring Super Tenere, the innovative Tricity and the Bolt C-Spec to a heritage series of Yamaha racing machines as well as the newest range of motorcycles currently available for sale from our local stable. 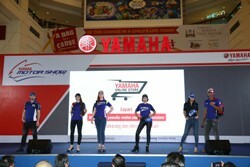 Visitors of the motor show will also have the chance to bring home original Yamaha apparels and accessories that are also made available for sale at the Yamaha Accessories booth. Visitors on Saturday the 8th of August will have the chance to witness the launch of a new Yamaha model at the main stage at 3 pm. Also scheduled to entertain on the Main Stage area are various performances by Raja Lawak contestants, Yamaha dance girls, a fashion show parade and a special concert appearance by Nadhira. Special daily programs have also been lined up for visitors to enjoy like the MT-Series hour and the Yamaha Motorsports Hour where we highlight our special long time collaboration with Petronas in promoting motorsports in the country and abroad. For the young at heart, get your adrenalin pumping at the Yamaha “Track Racer” corner, an exciting PC game incorporating Yamaha’s latest motorcycle models. The gamers who clocks the fastest time of the day will stand a chance to win special prizes.